CTOTalk by OrangeScape is India’s first knowledge-sharing platform exclusively by and for CTOs. The event series provides a rare deep-learning opportunity for aspiring tech leaders and have CTOs from well-known brands such as Walmart, Flipkart, Bigbasket, Naukri, Swiggy and Snapdeal come in as Guest Speakers. The sessions are intended to provide deep insights into different applications of technology. 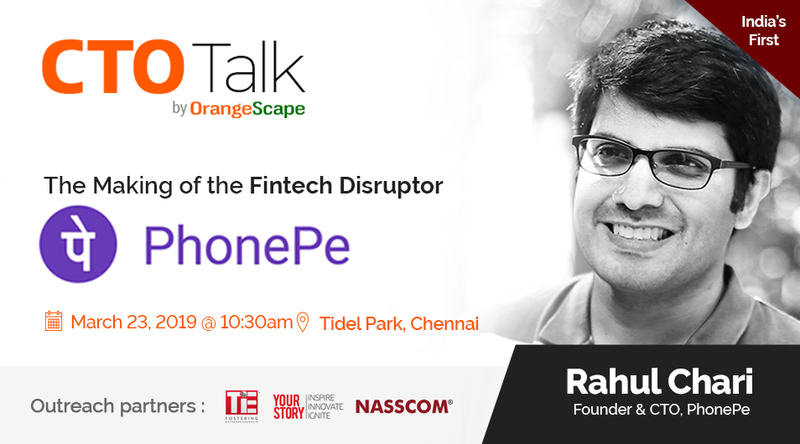 For the next CTOTalk, Rahul Chari, Founder & CTO of PhonePe will be joining to talk about 'The Making of the Fintech Disruptor"